TCR is delighted to welcome Emmy award-winning screenwriter (Veep, The Thick of It) and novelist David Quantick, who joins us to talk about his fantastic new novel, All My Colors, in conversation with the BBC's Peter Curran. 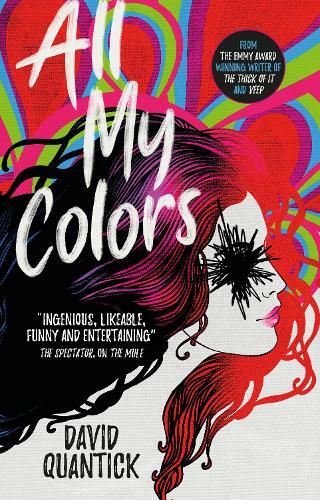 A bizarre, mind-bending story at the intersection of Richard Bachman, Charlie Kaufman and Franz Kafka, All My Colors is a darkly comic novel about a man who remembers a book that may not exist, with dire consequences. It is March 1979 in DeKalb Illinois. Todd Milstead is a wannabe writer, a serial adulterer, and a jerk, only tolerated by his friends because he throws the best parties with the best booze. During one particular party, Todd is showing off his perfect recall, quoting poetry and literature word for word plucked from his eidetic memory. When he begins quoting from a book no one else seems to know, a novel called All My Colors, Todd is incredulous. He can quote it from cover to cover and yet it doesn't seem to exist. With a looming divorce and mounting financial worries, Todd finally tries to write a novel, with the vague idea of making money from his talent. The only problem is he can't write. But the book - All My Colors - is there in his head. Todd makes a decision: he will "write" this book that nobody but him can remember. After all, if nobody's heard of it, how can he get into trouble? As the dire consequences of his actions come home to both Todd and his long-suffering friends, it becomes clear that there is a high - and painful - price to pay for his crime. The evening will see David in conversation with Peter Curran, followed by an opportunity for audience questions, then a book signing. Tickets are £10 including a copy of All My Colors, or £6 for entry only.